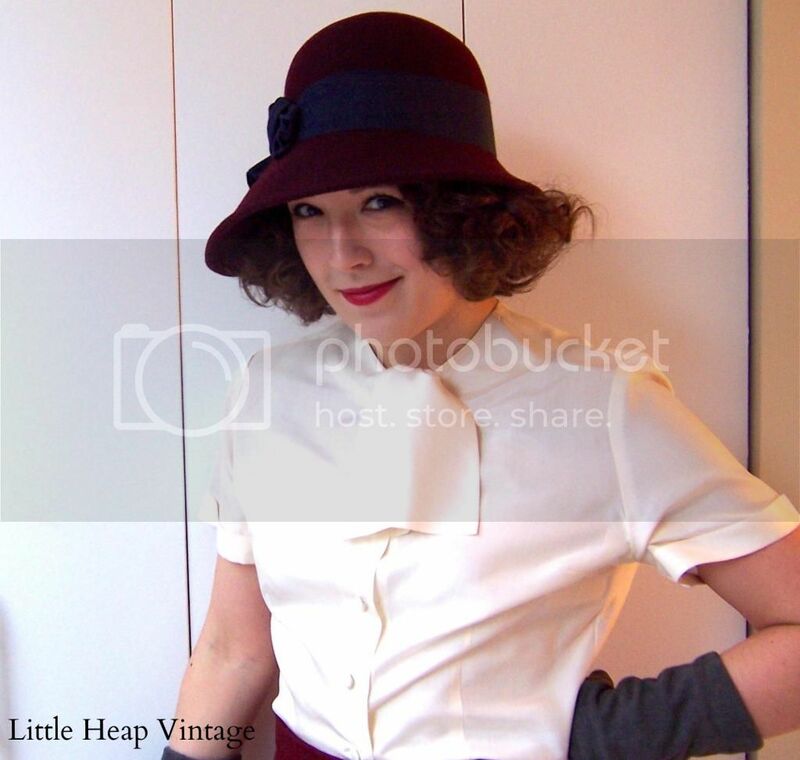 Little Heap Vintage: I made a skirt! As I've gotten more and more into vintage clothing over the past few years, and more familiar with the scene's unique challenges--scarcity, cost of maintenance, repairs, alterations, etc.--I started to realize I really should've learned how to sew. I had multiple opportunities--both my grandmothers are/were proficient sewers, and I could've learned during my foray into theater in undergrad. For some reason, though, I demurred, apart from a lone set of PJ pants I made with my paternal grandmother when I was young. I use the phrase "I made with" very, very loosely. In any case, when I gradually made the shift from a "well this is cool and unique and eco-conscious" collector to a "omg I'm obsessed" collector, I realized what a mistake I'd made. Last year (it's weird to be able to say that already, it's barely this year) I decided to do something about it. One of the best things about New York, and probably the main thing that could keep me here, is the overwhelming number of resources you have for just about any scene you're into. Taking up a new hobby is prohibitive only by cost, not availability. So with that in mind, I scraped together four and a half Benjamins and took Introductory Sewing at LoveSewing, a Burda Style-affiliated company that provides sewing classes of all levels, and publishes a magazine dedicated to sewing. Among the projects completed in the course, between learning various stitches and the basics of machines, are a drawstring bag, a zippered pouch, and… a skirt! 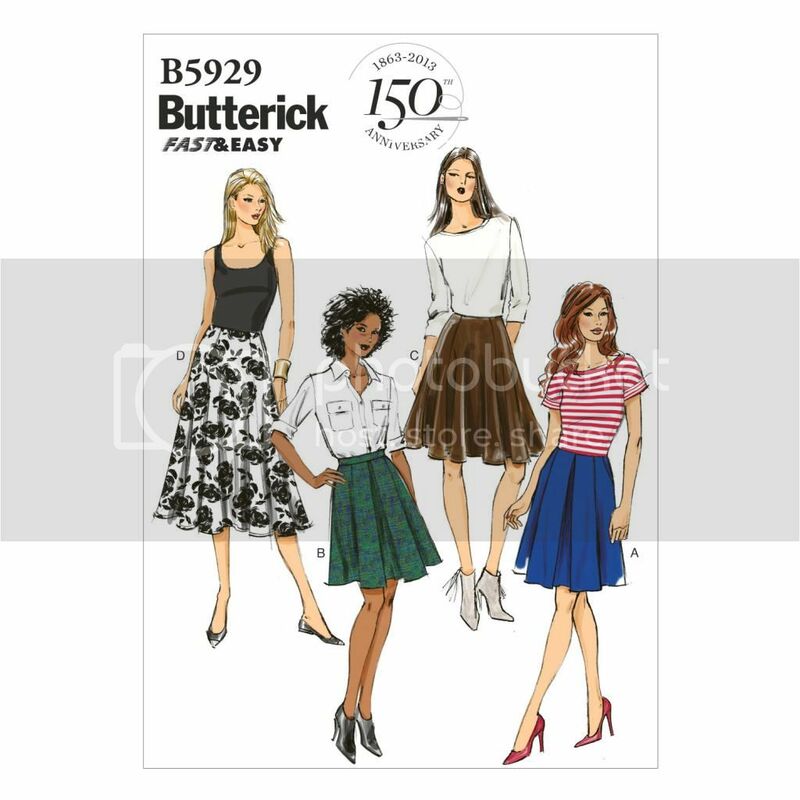 Following a Butterick's pattern (B5929) I went with pattern B (no pockets allowed yet, for sewing newbies) and since I wanted something that could fit in with my wardrobe, I made it a little longer. Of course, it could've been a few inches longer than this, if I hadn't made a mistake while cutting out the fabric. Knowing which pieces you don't need? Pretty much as important as knowing which ones you do. Oops. Slow your roll, patronizing pattern title. Fast & easy? I'll be the judge of that, thanks. I also decided to go with a nicer fabric-- a burgundy wool blend that made the skirt not exactly a bargain, in terms of pricing. It didn't really occur to me to try for a cheaper fabric, I suppose because the last thing a New York closet needs is a surplus skirt, and I really wanted to want to wear what I made. I'm happy with my choice, in part because I think the nicer fabric put a little constructive pressure on the sewing process. "No being sloppy (through laziness, anyway)--you paid too much for it!" During the alterations process, I thinned it out a little which, combined with the added length, lets it fall flatter, giving me a little more leeway in terms of styling it. It's obviously not perfect--the back hem is a little wobbly, as I was running out of time during the last class--but I'm really happy with it and am super excited about what it adds to my wardrobe. 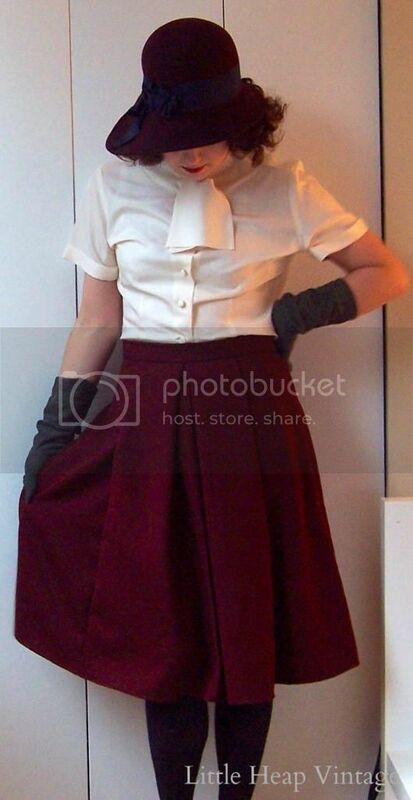 For its first spin, I paired the skirt with a silk blouse and an asymmetrical cloche hat for a sort of early 30s vibe. It's hard to tell from the photos-- winter lighting is the best, y'all-- but in another instance of wardrobe serendipity, the hat's color almost exactly matches that of the skirt. Funnily enough, I chose the fabric without realizing this, or that it'd go wonderfully with a 40s jacket I found in Dallas. It's not the first time I've done this (see my first post for a more extreme accidental matching), and I'm not sure whether it bespeaks great intuition or serious absentmindedness. Either way, I dig it. Anyway, I'm so glad I was able to take the class, and I'm already signed up for another one! In the meantime I've got another project in mind--a mid-calf circle skirt to wear with a new petticoat--and I'm jazzed to start getting everything together for it! Photography Lesson #24: That lamp you think is helping light your shot? 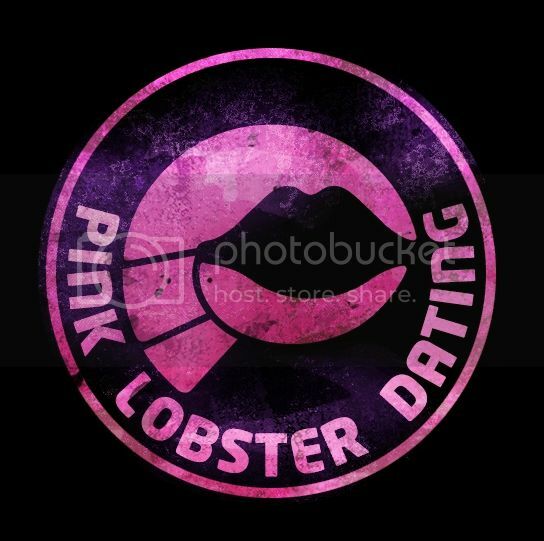 Actually makes you look a little radioactive. Nicely done. And the suit in your last post is divine! Thank you! I actually didn't realize until your comment that I posted on two sewing projects back-to-back! Anyway, I'm pretty happy with both-- thanks! You did a great job! You were smart to chose a higher quality fabric. Why put work into something cheap? That's what I thought, too, though I was slightly afraid I'd just have a really horrible skirt in a great fabric. Which might be even more depressing than poor fabric! Fab skirt! And that blouse is adorable! 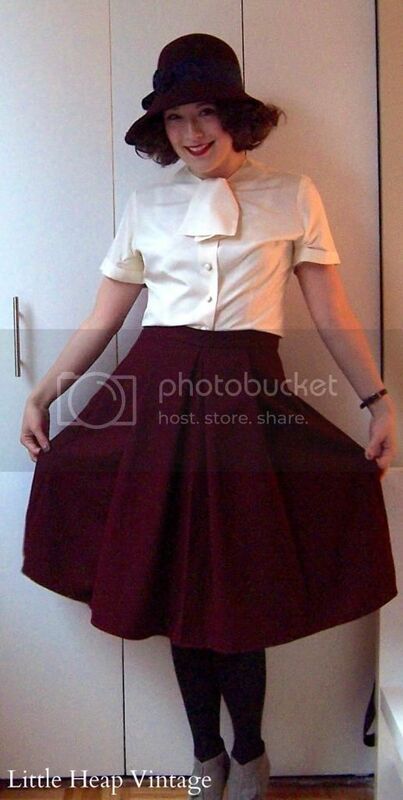 Not only did you make a skirt, but you made a skirt in my second favourite colour of all time (such a fan of burgundy am I, in fact, that it's the colour we painted our master bedroom in our current house and it features elsewhere throughout our decor, too) - and what a classic, immensely lovely one it is! I really like how you styled it, too. You remind me that I need to up the number of white blouses in my wardrobe - especially if I can find ones as classic chic as this great tie-neck number.